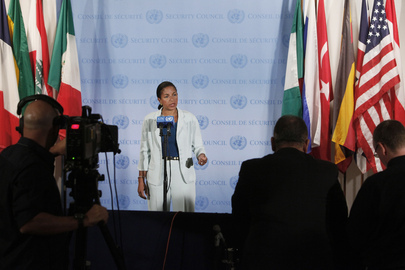 UNITED NATIONS, February 9 -- When US Ambassador Susan Rice came to the UN Security Council stakeout late Wednesday morning, she was prepared to answer questions about the Tax Equalization Fund, some of which Inner City Press submitted to the US Mission Tuesday morning. In the House of Representatives a proposal is being considered to get the $179 million owed to the US applied to future UN dues. At some date still undisclosed, some US State Department official told the UN it could keep $100 million for security upgrades in the Capital Master Plan renovation, beyond the CMP security elements already approved by the General Assembly, for which the US pays 22%. Inner City Press asked Ambassador Rice who had approved this, and if any other country would be contributing toward the $100 million in additional security. Ambassador Rice said that the Obama Administration opposes the House legislation. She cited Republican Congressman Peter King of Long Island as supporting this position. 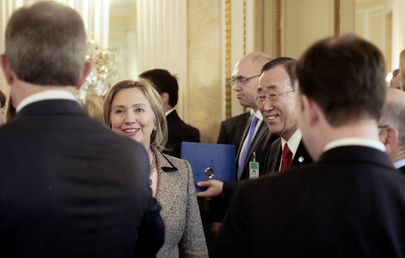 Her answer implied that no other country is contributing to the $100 million -- she spoke only about $79 million of the $179 million being put toward UN dues. She did not say who had approved the $100 million. Inner City Press began asked what Ambassador Rice would say to those who now consider the $179 million, or at least $78 million of it, to be a slush fund -- Ambassador Rice asked, “Slush fund? There is no slush fund,” and her spokesman moved on to another questioner. Transcript below. Minutes later at the UN noon briefing, Inner City Press asked UN spokesman Martin Nesirky who the UN had spoken to within the US government to conclude that these $100 million could be spent, and if it had ever been approved or presented to the UN General Assembly. Nesirky again said, ask the State Department -- we have -- and said he would look into whether there are other Capital Master Plan related funds that have not been disclosed or voted on by the General Assembly. When asked to explain why the $100 million was so urgent it could not go through regular budgeting (and disclosure) procedures, Nesirky said to ask the State Department. Ultimately, who within the Secretariat is responsible for spending this money? DM? DSS? Has the General Assembly given its approval to this project? Is there a mandate from the GA for this activity? Answers will be reported when they are received. Watch this site. Inner City Press: On Sudan, what do you make of this fighting in Malakal? The army, there are several dozens of people who have been killed of late, what does the US think of that? And I wanted to ask, on the Tax Equalization Fund—there’s a dispute in the House about this $100 million that the State Department has told the UN it can use for security improvements. Who approved that at the State Department and are other countries going to be contributing to that, or is the US paying the whole $100 million with no offset on the CMP payments? Ambassador Rice: Well, let me start with Malakal. Obviously we’re very concerned about the violence in Malakal and along that border area. This is a function, as you know, of the need for these units that have been joint to now separate, and it is of concern that lives have been lost and violence has occurred, and it underscores the need for this process of disintegrating the joint units to be done carefully and with some supervision. Let me turn now to the Tax Equalization Fund, and the application of these credits. The legislation that is pending in the House today is a piece of legislation the administration strongly opposes. And we do so because it was the City of New York that underscored the vital importance to US national security to enhance security—physical security—in this structure, above and beyond what was originally contemplated during the Capital Master Plan. We have thousands of New Yorkers who pass through this building and under this building every day. We have school children, we have members of the public, we have the President of the United States, come in this building on a regular basis. And the City of New York and the State Department and the administration feel that it’s in our national interests and in the interests of the people of New York that steps be taken swiftly to upgrade the physical security of this building. And that is what we have done, in coordination with the United Nations. That is also why Representative Peter King—a New Yorker—who is chairman of the Homeland Security Committee in the House, said very plainly yesterday that this is a crucial commitment that we’ve made, one that should be honored, and he opposes this legislation because it unwisely would make that impossible. Let me just say also, Matt, we share, however, the spirit in which the legislation is offered, which is to reduce the deficit and to address the need for spending reductions. But the other portion of those credits—the $79 million—will do just that, because we intend to apply those to assessments that we would otherwise have to request resources from Congress to pay. So this is a way of ensuring that we are utilizing taxpayer dollars wisely. Inner City Press: So it’s kind of a slush fund, there’s no approval? Ambassador Rice: Slush fund? No, there’s no slush fund. As US Let UN Keep $100 M for Security, Who Decided, Will $78M Be Offset & Will Other Countries Pay? UNITED NATIONS, February 9 -- Who approved the use of $100 million in US funds to pay for the entirety of a security project in the UN's Capital Master Plan renovation? As the battle to have the funds returned heats up in the House of Representatives, the UN on Wednesday belatedly answered some of the questions asked by Inner City Press. While the US Mission to the UN has not responded in writing to questions Inner City Press put to it, the position is that the UN approached the US State Department to ask for $100 million from the $179 million which otherwise would reduce the US' dues to the UN. The UN said that the improvements, which have be tied in FP's Cable blog to dangers posed by car bombs on the FDR Drive, were urgent. The conference rooms over the FDR Drive are currently empty, undergoing asbestos abatement. It is hard to understand how merely reconfiguring the rooms would cost $100 million, or be urgent. But even if it is urgent, why is the US paying the whole $100 million, and not just the $22 million that would represent its 22% share of CMP costs? Will the extra $78 million be subtracted from what the US would otherwise pay for the rest of the CMP? Inner City Press recently asked the CMP about contributions of $2 million and $1 million to the CMP from Norway and China. The response were article the CMP had placed on the UN's i-Seek web site. If the UN publicized $1 million from China, why no secretive on $100 million from the US? Inner City Press understands that the decisions on this $100 million (or $179 million ) slush fund were made at a level above Assistant Secretary of State Brinner. So should or will it be called Hillary's slush fund? Watch this site. Cynics say that with the US trying to show it deals differently with the UN, it is or was convenient to have $100 million in discretionary funds. But there are questions about the approvals. Here is what the UN sent Inner City Press on the morning of February 9. Other questions remain pending. The 31 December 2009 audited accounts of the UN showed as balance due to the United States of $179.0 million as of that date. The US levies taxes on its nationals in respect of their UN earnings, and reimburses the UN for the same. The balance represents the net amount due to the United States after such reimbursements have been taken into account. In some financial periods there is a surplus, and in others a deficit. The net balance of $179.0 million has accumulated since 1 January 1996. Regarding security improvements: The Capital Master Plan (CMP) already includes a number of security improvements for the delegates, staff, and visitors who work at or visit the premises. Those security improvements have been designed after consultation with the Host Country security authorities. They are covered by the budget of the CMP, to which the U.S. contributes 22%, and which was approved by the General Assembly in 2006. The present discussion about additional security upgrades reflects heightened security concerns by the Host Country and UN security authorities. The U.S., under its Host Country obligations, is funding these new security upgrades. The total anticipated cost of the new security upgrades is $100 million. On Myanmar, As EU Prepares Visit, Ban Delays Replacing Nambiar, GA Mandate To Be Cut? 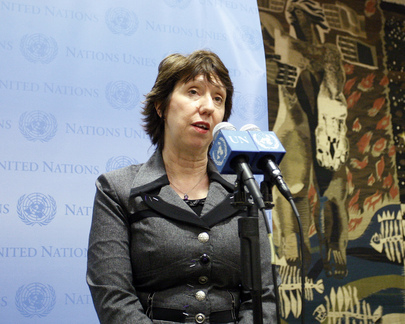 UNITED NATIONS, February 8 -- When the European Union's Catherine Ashton came to the UN on Tuesday, Inner City Press asked for the EU's position on Myanmar, and to contrast it with Secretary General Ban Ki-moon's. By contrast after Ban's chief of staff and part time Myanmar envoy Vijay Nambiar visited Aung San Suu Kyi, when he returned his internal assessment within the UN as conveyed to Inner City Press by well placed UN sources was that she is out of touch and too hard line. Inner City Press asked Ashton if she agrees with Ban Ki-moon's recent assessment, if the EU is on the same page. Ban Ki-moon put out a statement about the new parliament, 25% of whose members are appointed by the military and in which proposals have to be shown to a screener 10 days before they are introduced, with the possiblity of prohibition without any chance of appeal. In response to your emailed question about the dissolution of the NLD in Myanmar, we have the following to say: We have taken note of the decision with concern and continue to follow developments closely. We believe that in order to succeed any transition must be inclusive and participatory, including both those who won seats in the recent elections and those who did not participate. Regarding the Rohingya boat people, UNHCR is trying to obtain access; please follow up with UNHCR on that matter. On replacing Nambiar, the UN has had nothing to say. Now, sources in the UN tell Inner City Press there is a reason. The goal is to get the entire UN mandate on Myanmar eliminated in the General Assembly, by pointing to the new parliament and recycled president. That, the sources say, explains Ban's statements and delay. Watch this site.